Further east on 31st, the building on the SE corner of 31st and Campbell is being renovated (windows restored on the first level) and has "For Rent" signs up on the retail portions. The buildings on the SW corner of Campbell have seen some work as well. There is a sign on the building directly on the corner that seemed to indicate some sort of robotics makerspace. The building in the middle of the stretch has seen a lot of work and the permits are showing conversion to single family (strangely enough). Also across from Rock-A-Fire where the printing place use to be there is a new place is new called Eleve Dancewear, it looks like they make Leotards and other dancewear. Looks like they relocated from 1500 Grand but I noticed they have a little retail shop as well as a production area to make the leotards at this location. Is impressive all the off/on underutilized spaces around Midtown for decades are now getting more substantial tenants. Corner buildings in neighborhoods getting action too throughout Midtown, like along Gilham and the one at 43rd/Walnut in Southmoreland - laundry mat, coffee shop, bakery, clothing store, laundry mat and something else. Would be nice to see Martini Corner get more neighborhood/ethnic mix like W39th. Has all the momentum to become another W39th. earthling wrote: Is impressive all the off/on underutilized spaces around Midtown for decades are now getting more substantial tenants. Corner buildings in neighborhoods getting action too throughout Midtown, like along Gilham and the one at 43rd/Walnut in Southmoreland - laundry mat, coffee shop, bakery, clothing store, laundry mat and something else. Would be nice to see Martini Corner get more neighborhood/ethnic mix like W39th. Has all the momentum to become another W39th. It's good evidence that retail succeeds when it follows residential rather than the other way around. I think some activity has been taking place in the Berbiglia space recently. Wasn't one of the buildings rumored to be a vegan restaurant from one of Fud's partners? kcjak wrote: I think some activity has been taking place in the Berbiglia space recently. Wasn't one of the buildings rumored to be a vegan restaurant from one of Fud's partners? I thought the rumor was that they were going into the Bitterman's Candy development. I'm not sure if that was supposed to be instead of, or in addition to the Kimchee Korean restaurant. I just looked up the permits and I see a couple from earlier this month for ARC Physical Therapy. Looks like that will be the new tenant. The progress of filling up/activating these spaces around 31st has been agonizingly slow, but is picking up pace recently. I would think there would be more demand for that area. Armour Blvd has to be one of the most densely populated strips in KC, but it seems rather under-served. Add in all the growth in Union Hill and Beacon Hill, improvements in Longfellow and North Hyde Park, all the jobs and students at Hospital Hill, you would think that section of town could support more (and better) restaurants and retail than it currently has. However, it seems like the currently existing retail spaces are slow to fill. 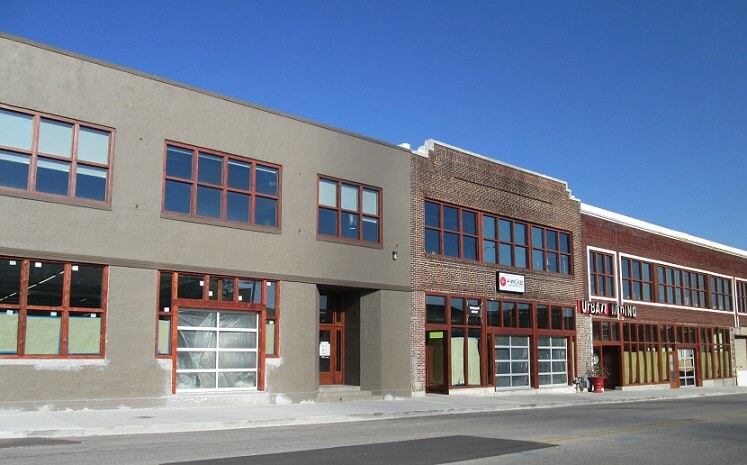 Many of the new spaces on Gillham in the mixed-use Union Hill buildings have been sitting for a while. The former flower shop has been renovated and looking for new tenants for a while now. The one exception seems to be Butch Rigby's Bitterman Candy project which seemed to fill up immediately. I think the biggest roadblock for 31st St to reach its full potential is wrestling the properties from entities just sitting on them or holding them for low use. Bob Frye expressed frustration with this situation as his development in Union Hill was being completed and he was looking to expand. He does own several lots on 31st west of Martini Corner. I'm not sure if he is holding out to obtain more surrounding parcels before developing, but I would hope that something gets done before the streetcar is rolling by. The parking lots owned by KCPT north of 31st St really seem extraneous and I would hope they could be sold. KCTV owns the grass lot to the east of their tower. I'm not sure why they are holding on to it but there may be some reason relating to the tower. The Midtown Mattress building is one of the more frustrating cases. The same company also owns all of the grass lots behind it. I don't know what they are doing besides squatting on it. East of Martini Corner, the biggest culprit is Superior Linen. I don't think I realized it at the time, but those are owned by Superior Real Estate Venture, LLC. I'm not sure what the story behind this land is . I wonder if Superior Linen originally planned to use these buildings, or if they had a separate real estate venture planned. Either way, I'm glad to see they are selling and I really wish they would just move and sell all of their property. Most of those empty lots around the KCTV tower were brought up over the years because it was cheaper than to continue to pay for damages from ice falling on buildings from the tower. There was a piano company that even had damaged pianos in the showroom. I don't know if liability insurance to cover an inevitable fatality would be available or could roofs be made strong enough to absorb ice fall. I certainly do not consider Superior Linen to be a "culprit." While not pretty they provide employment and have not fled to suburbia. I think the Velvet Freeze is more a culprit and a bigger eyesore than its footprint would suggest. The Gallerie opening will bring more customer base for retail shops and services. While Gallerie will offer some of its own, it is only 3 blocks north of 31st. Superior is a culprit because they have been holding numerous buildings and lots that are vacant. They have also torn down a few buildings. The buildings they do use are not well maintained and look ugly. I don't know how many jobs they provide, but with the massive amount of dead space they create, I would still consider them a net negative. They would fit much better in an industrial area than the middle of a neighborhood. There are many other options for them besides suburbia. Do they do the linens for hospital hill? They may want to stay in that location or close by for that reason. earthling wrote: I don't think I realized it at the time, but those are owned by Superior Real Estate Venture, LLC. I'm not sure what the story behind this land is . I wonder if Superior Linen originally planned to use these buildings, or if they had a separate real estate venture planned. Either way, I'm glad to see they are selling and I really wish they would just move and sell all of their property. Martini Corner seems to suffer a bit from having single owners of a string of lots/buildings, not to degree of Plaza but W39th doesn't have this issue as much. There's a consistent pattern that individually owned lots can spur more organic development, but something needs to spark to get a momentum whereas with a single owner of large stretches, the owner itself is the spark and tries to cultivate/manufacture a targeted vibe (Plaza, P&L) for better or worse. In the case of E31st, would probably be more ideal if ownership were broken up in order to hit W39th type of organic mix. Simply opening up the facades of those buildings has created a dramatic improvement! Next, I would love to see the street narrowed with wider sidewalks and street trees added. I wonder if that stretch used to have diagonal parking at one time? superior linen is a bit of a culprit - agreed. i tried several times to buy either all of west side of cherry or dead lot on 31st and couldnt put enough nails in the jello to hold it still. doesnt know what he wants, doesnt know what price he would sell for as targets always moves and as to employment, there have been many crimes associated with employment and surroundings that I contend it is not an asset to the area. that said, we are also a culprit in leaving our corner stagnant after a poor choice of architects who didnt understand the business of business. in process to do our part to re-activate this with multiple commercial tenants hopefully 2-3 that the neighborhood would apprecriate. and yes, kudos to Butch's efforts also. Jumpn shoult about a revival for M Corner and Tower East. Who is "we" and "our corner?" moderne wrote: Who is "we" and "our corner?" 31st and Gillham. Epoch Development.